Ease of use, value, and overwhelming good reviews make this microwave popcorn popper from Salbree our top pick for best overall. The silicone bowl is collapsible for simple storage, and when you’re ready to use it, just expand it and add the kernels. You can add oil before or after popping, or none if you’d prefer. It can hold up to half a cup of kernels, and when they’re done, you can take the bowl out of the microwave with the convenient side handles. Plus, cleanup is a breeze since it’s dishwasher safe. People really seem to love this little bowl, with the majority of reviewers giving it five stars and many using the adjectives “best,” “wonderful,” and “perfect” to describe it. The simplicity of the whole thing is what users seem to love the most, followed by the taste of the popcorn, which is similar to air-popped. 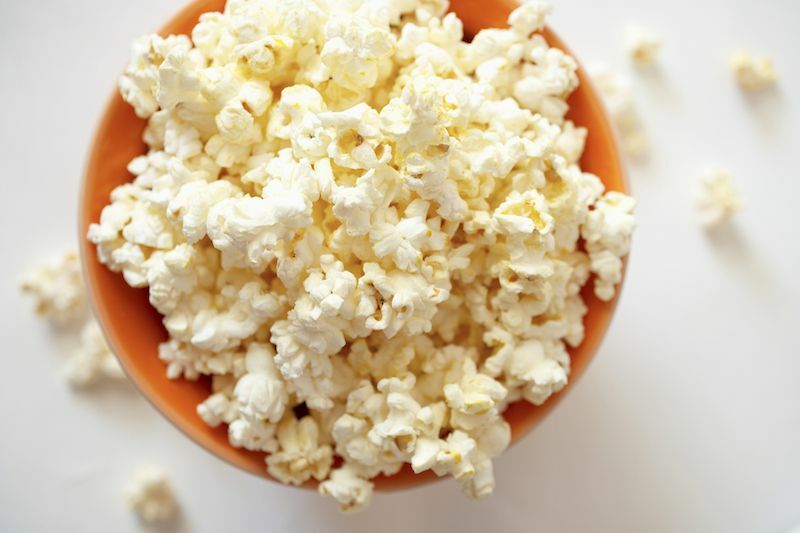 Some have reported issues with the popcorn burning, and one pointed out that the bowl is too soft and collapsed when filled with the kernels, but most people found success with this product. If stovetop popping is more your thing, this popper from Wabash Valley Farms is a great choice. According to the description, it can make six quarts (about 24 cups) of theater-style popcorn in just three minutes. The pan is made of sturdy aluminum and has a clip-on lid with a wooden handle and stainless steel stirring system that prevents sticking and burning. The best part of all is the easy cleanup. All you have to do is wipe the parts down with a paper towel. Customers say it’s great, but it’s really important to read the instructions — especially when it comes to the heat setting. You should use medium heat, not high, for best results. A lot of people praised the taste of the popcorn from this popper and appreciated how well it popped the kernels. Just know though, it’s a little bit more work than a microwavable one, but if you’re willing to put in the effort, you’ll love the outcome. Here’s a great well-reviewed microwave popper that will satisfy your popcorn cravings. The bowl can pop up to three quarts of popcorn in about two and a half minutes and features PowerBase and PowerCup concentrators that combine to focus microwave energy so effectively that virtually every kernel pops, according to the description. It’s also easy to clean as the bowl and cover can both be placed in the dishwasher. Customers have been mostly happy with the quality of the product and how the popcorn comes out after using it. Many have said it’s a good value and worth every penny. Some have said the popcorn has come out burned, and others warned that you have to buy replacement cardboard filters for it to work, but the majority of those who purchased it said they’d recommend it to others. If an electric popcorn maker is more your speed, this one from West Bend is a great pick. Besides being super easy to use (an on/off switch controls the motorized stirring rod to make sure all the kernels pop), it’s also got a fun and convenient feature in the cover. After you’re done making the popcorn, just use the large lid as the serving bowl — it’s a 2-in-1 product! The Stir Crazy popper can make about 27 cups of popcorn in about four minutes. You can make it plain or add butter and seasonings. Customers who have purchased this machine have mostly great things to say about it. They love the compact size and the quality of the popcorn it makes. One reviewer did point out however that it’s harder to clean than others because the popping surface isn’t removable so oil and seasonings can get trapped in the edges. But most people were happy with it and would recommend it to others. A top seller in its category, this air popper from Presto has received rave reviews from customers. It’s a healthy option since you pop the kernels without oil — the machine uses hot air instead, but you can still use butter if wanted. You can get up to 18 cups (two large bowls) of regular or gourmet popcorn in less than two and a half minutes, according to the description. It’s also fairly simple to clean — just wipe the base and cover down with a paper towel. Many of those who’ve used this popper have nothing but praise for it, calling it “fun,” “durable,” and “super easy.” Just a word of warning, though: it pops the kernels pretty fast — which is great, of course — but you’ll want to have a large bowl at the ready to catch the popcorn, otherwise it’ll make a big mess. Also, since there’s no on/off switch, it’s kind of awkward having to unplug it when you’re doing popping. But if those don’t sound like deal-breaking issues, it’s a great choice.